Almost all buildings in the city of Tuguegarao - the capital city of the north-eastern Cagayan province - sustained some damage, a government official said, and communications were down in places. Two rescuers died trying to help people trapped in a landslide. Unverified reports say the body of a young girl was found in the Marikina river, which flows through Manila. The mayor of the Baguio City said five people were killed there. Mauricio Domogan told CNN Philippines a similar number were also missing and the sewerage system was being overwhelmed by the floodwaters. The evacuation centre in the coastal town of Aparri is said to have been destroyed and phone networks are down. 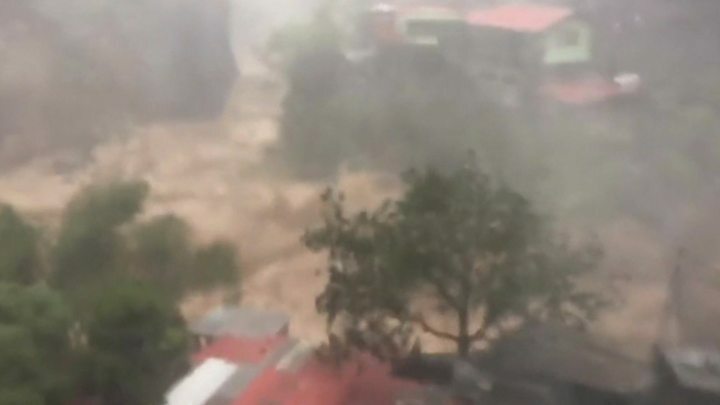 BBC correspondent Jonathan Head, who is in Luzon, saw 200 people who had taken shelter in one school being re-evacuated because a dyke holding back a swollen river was about to burst. The full cost of Typhoon Mangkhut on one of the country's most important food-producing regions cannot yet be assessed, he says. The typhoon recalls memories of the deadliest storm on record in the Philippines - Super Typhoon Haiyan in 2013 - which killed more than 7,000. However, preparation and evacuation procedures have been improved since then. The typhoon made landfall at Baggao, in the north-east of the Philippines, at about 01:40 local time on Saturday (17:40 GMT on Friday), and left the country some 20 hours later. After losing some of its wind speed over land as it headed west, the storm was downgraded from a super typhoon. It is forecast to weaken slightly as it approaches China from the south-east. The storm - known locally as Ompong - has a cloud diameter of about 900km and is heading west at about 30km/h. The World Meteorological Organisation (WMO) billed the storm as the strongest tropical cyclone the world has faced so far this year. The typhoon is forecast to pass near Hong Kong on Sunday afternoon. In nearby Macau, shops have been boarded up and residents have been sticking tape on their windows. How prepared was the Philippines? 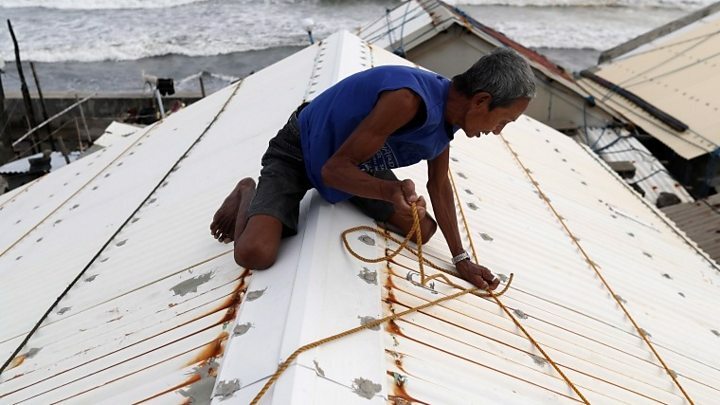 Authorities in the Philippines have said they were better prepared for the storm than in previous years. Warnings were issued in dozens of provinces. Travel by sea and air was restricted. Flights were cancelled, schools shut and the army was on standby. Is Hong Kong in danger? Fears that Mangkhut may be classed as a super typhoon again when it reaches Hong Kong on Sunday have receded, though it is still forecast to be a strong storm. Residents have been preparing. Tape has been stuck to the windows, creating ominous X-shapes on the front of homes and offices, and some bamboo scaffolding also appears to have been taken down or secured as a precaution. People are being told to stay indoors. Antoine Li, a government official at an emergency centre in the village of Tai O on the western coast of Hong Kong's Lantau island, said residents must not underestimate the storm. "This typhoon will be very dangerous as it will arrive when everyone is sleeping and there is no way to leave. So we have called on residents to leave the village before it gets dark," he told Reuters news agency. A shop owner in the village said: "Everyone is scared of the typhoon this time, very scared", and they are more worried about the elderly living in stilt houses, who insisted on staying. How have you been affected by the typhoon? Email haveyoursay@bbc.co.uk.